And here, beloved Sons and Venerable Brothers, We should mention again and censure and very grave error in which some Catholics are unhappily engaged, who believe that men living in error, and separated from the true faith and from Catholic unity, can attain eternal life. Indeed, this is certainly quite contrary to Catholic teaching. It is known to Us and to you that they who labor in invincible ignorance of our most holy religion and who, zealously keeping the natural law and its precepts engraved in the hearts of all by God, and being ready to obey God, live an honest and upright life, can by the operating power of divine light and grace, attain eternal life, since God who clearly beholds, searches, and knows the minds, souls, thoughts, and habits of all men, because of His great goodness and mercy, will by no means suffer anyone to be punished with eternal torment who has not the guilt of deliberate sin. But, the Catholic dogma that no one can be saved outside the Catholic Church is well-known; and also that those who are obstinate toward the authority and definitions of the same Church, and who, persistently separate themselves from the unity of the Church, and from the Roman Pontiff, the successor of PETER, to whom “the guardianship of the vine has been entrusted by the Savior,” cannot obtain eternal salvation. To Our Beloved Sons, S. R. E. Cardinals and to Our Venerable Brothers, the Archbishops and Bishops of Italy. 6. Now, since our Apostolic Office demands we carefully and zealously defend the cause of the Church committed to us by Christ, we condemn those who attack and despise the Church itself, its sacred laws, ministers, and this Apostolic See. Hence, with this letter, once more we confirm, proclaim and condemn totally and singly that which in many consistorial allocutions and in our other Letters we have been forced to deplore, declare and condemn. 11. Now, truly, we cannot conceal the fact that we are in great anguish since there are some clergy in Italy who, forgetful of their vocation, do not blush in the least to spread abroad false doctrine, even in subversive writings. They arouse the people against us and this Apostolic See; they oppose our civil rule and that of the Chair itself; they shamelessly and zealously support the wicked enemies of the Catholic Church and this same See. Deserting their bishops and us, emboldened by the approval of the Piedmontese government and its Parliament, these ecclesiastics in open contempt of ecclesiastical censure and penalty have become impudently fearless in organizing certain condemnable societies commonly known as Liberal Clerical, of Mutual Assistance, For the Emancipation of the Italian Clergy, and other associations animated by the same depraved spirit. Although deservedly forbidden to perform their holy ministry, nevertheless, like brazen intruders, they sinfully and illicitly exercise it in many churches. We, therefore, disapprove and condemn the behavior of the same ecclesiastics. At the same time, we admonish and exhort, again and again, these unfortunate men to return to their right mind and heart and take thought for their own salvation, seriously considering “that God tolerates no example of conduct more from others than from priests when He sees those, whom He ordains for the improvement of others, give example of their own depravity.” Let them fervently reflect that their confused state must be repaired before the tribunal of Christ. May these pitiful churchmen heed our paternal advice and willingly render us the consolation of a repentant clergy. May they seek refuge in us day by day, begging pardon for their defection with suppliant prayer and humbly imploring absolution from ecclesiastical censure. 12. You are certainly aware, our beloved sons and venerable brothers, that every kind of impious and deceitful writing, lies, calumny, and blasphemy has been let loose from hell. No pain has been spared to transfer schools to non-Catholic teachers and to appropriate churches for non-Catholic worship. With a multiple of other, surely diabolical treacheries, arts, and undertakings, the enemies of God employ every effort to destroy completely-if that were possible — the Catholic Church, seduce and corruupt the people, especially guileless youth, and uproot our holy faith and religion from the souls of all. Given at Rome, at St. Peter’s, 10 August, 1863, in the eighteenth year of Our Pontificate. 1. St. Leo, epistle 154 to the bishops of Egypt, ed. Baller. 2. St. Leo, sermon 82 on the feast of the apostles Peter and Paul. 3. Addresses on 20 June 1859; 26 September 1859; 13 July 1860; 28 September 1860; 17 December 1860; 18 March 1861; 30 September 1861; and 9 June 1862. 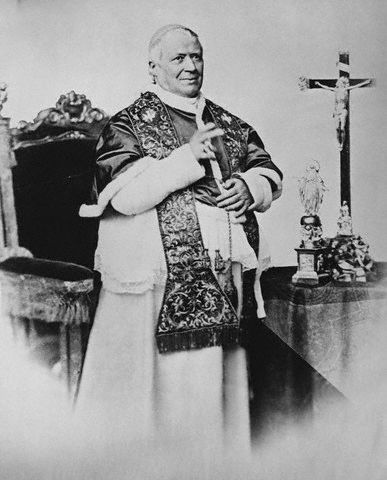 Encyclical letters on 18 June 1859 and 19 January 1860. Apostolic letter on 26 March 1860. 4. Ecumenical Council of Chalcedon in its letter to Pope Leo. 14. St. Gregory the Great, homily 17 in Evangel. 15. St. Leo, epistle 167 to Rusticus, bishop of Narbonne.